"The strangely dark creation story of one of the best loved children's characters of all time..."
If all you know about this film going into it is that it’s about the author of Winnie the Pooh, you’re certainly in for a surprise. That much is certainly true — Domnhall Gleeson plays a restrained, haunted A. A. Milne, and Margot Robbie plays his demanding, socialite wife. The film is much darker than you might expect though! Everyone’s got a memory of Winnie the Pooh from their youth, but Milne himself is a bit of a mystery for most of us. 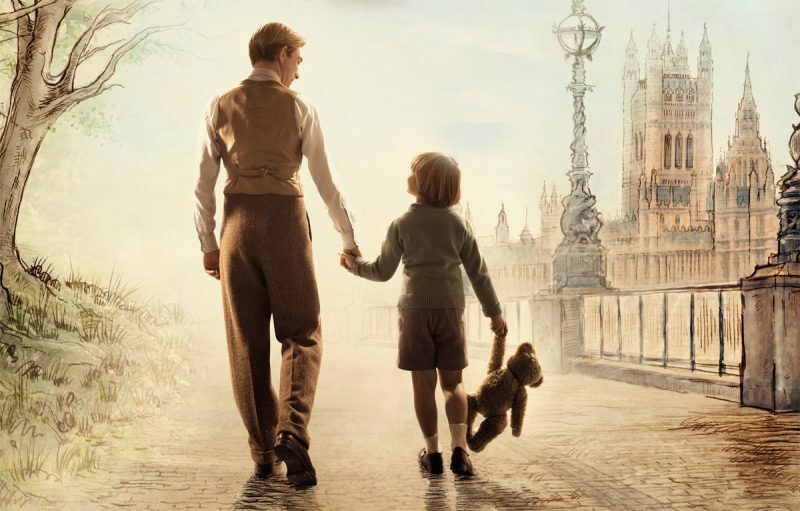 The film reveals that Milne suffered from a severe case of PTSD after serving in World War I, which shapes the whole of the film and his relationship with his son: nicknamed Billy Moon but really named Christopher Robin, upon whom the infamous character was based. Gleeson balances well the serious, troubled veteran, and the glitzy West End writer, both of which personas vie for dominance over the sweet and well-meaning father Milne is underneath it all. He has such a tight lid on all the complexity going on in Milne’s head that it’s sometimes difficult to sympathise with the character, but that seems to be part of the intent. Robbie’s character Daph is undoubtedly a hard one to like — a petulant wife and a painfully distant mother. Though it is she who gives her son the toys that will become the beloved Winnie the Pooh characters, they seem to be a replacement for her love rather than an expression of it. Robbie plays the role with panache, revelling in Daph’s put-upon sensibilities, but still managing to convey the vulnerability beneath her glittering mask. 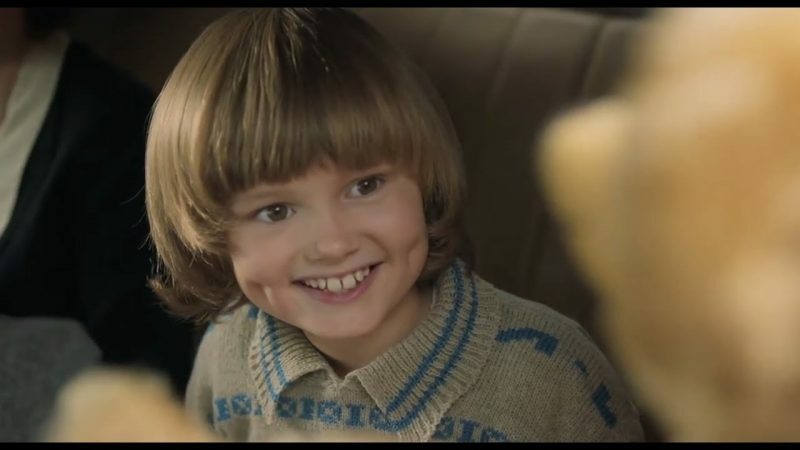 Billy is played by the wonderfully sweet 8 year old Will Tilston, whose dimples are to die for and who has a remarkable seriousness for such a young actor. Through Billy’s experiences we see the difficulty his father faces after the war, and his mother’s disappointment at their moving to the countryside away from London. It’s here, in Ashdown Forest (the real 100 Acre Wood), that we see the idyllic days of play between father and son which inspire the phenomenon of Winnie the Pooh. The magic of the books is beautifully rendered on screen, as their imagination runs wild and the audience are brought along in their make-believe games. I challenge anyone not to get a little emotional as you see illustrations from such a treasured childhood classics brought to life! Though this bonds the father and son, the emotional heart of the film is the relationship between Billy and his nurse (Kelly MacDonald), affectionately called “Nu.” The contrast between her unconditional love for the child, and his parents’ odd changeability in their affections is stark and distressing. Though perhaps period typical, it’s hard to watch the emotional neglect Billy suffers as he is thrust into a world of fame where the whole world wants to meet the real Christopher Robin. The weakest part of the film was definitely its ending, which crossed the line into the unrealistically melodramatic, and was too rushed to give the audience any true satisfaction. The lingering effects of the last great war, and the next looming on the horizon make for very tense and politically charged bookends for this familial tale that will make you view Winnie the Pooh in a totally different light.